← He is not here, He is risen! Last night’s full moon was the kick in the pants I needed to get all my altars set up! We’ve got all the furniture we’re getting for a while. We’re Officially Moved In to our new home. I decided that I would use the full moon and all the energy from the solar flares – plus I had had a FULL NIGHT’S SLEEP (first one in over a year) – and bless all the altars. This is our family altar. In the passage between the living and dining rooms there is this curved space, where the phone box used to be. 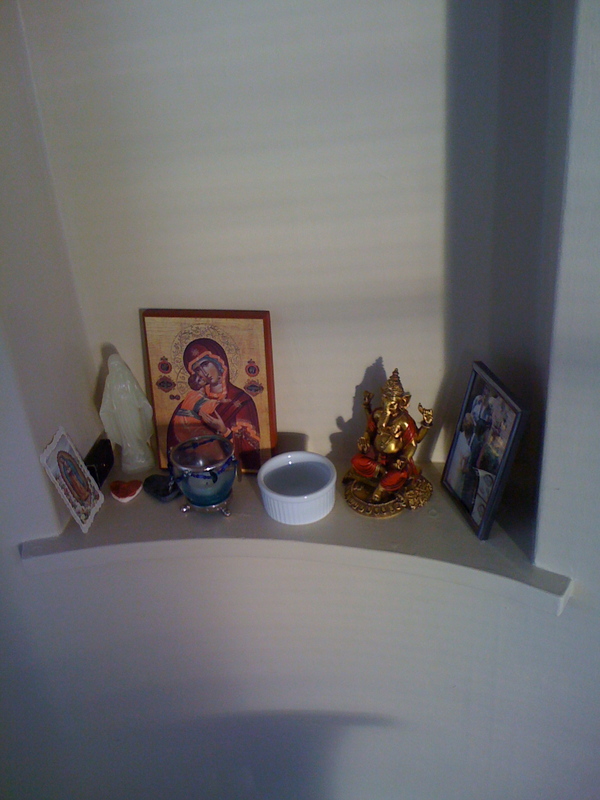 I’ve turned it into our house hold altar. The Virgin Mary stands on the left in several forms: pretty prayer card for La Virgin de Guadalupe (patron saint of North America), glow in the dark plastic form, and icon of the Theotokos. I may not be a Christian anymore, but it is her love and guidance that kept me in that tradition for as long as I was and she opened opportunities for me. I am grateful to her and she will ever have a place in my home. Next is a white ramekin for offerings. I hope to replace this with a nice offering plate, once I find one. We then have a statue of Ganesh, patron saint/god of our family. This was my son’s statue and he offered to the family. On the far right is the picture of my name-sake and grandmother. I have a little ancestor section in my main altar case, but I felt that family ought to be together! So she is out with us. My son says good morning to her sometimes. But mostly wants to know why and how she died (in a car accident in 1954). Moving into my office, we have a picture of a corner of my desk. Ganesh did not want to be put in the case. He’s very clear about where he wants to be. This photo is from this morning. I’m burning some sandalwood incense. Around him is a ceramic heart my son made in preschool, a penny for the first offering (I need a plate), and a vial of perfume. 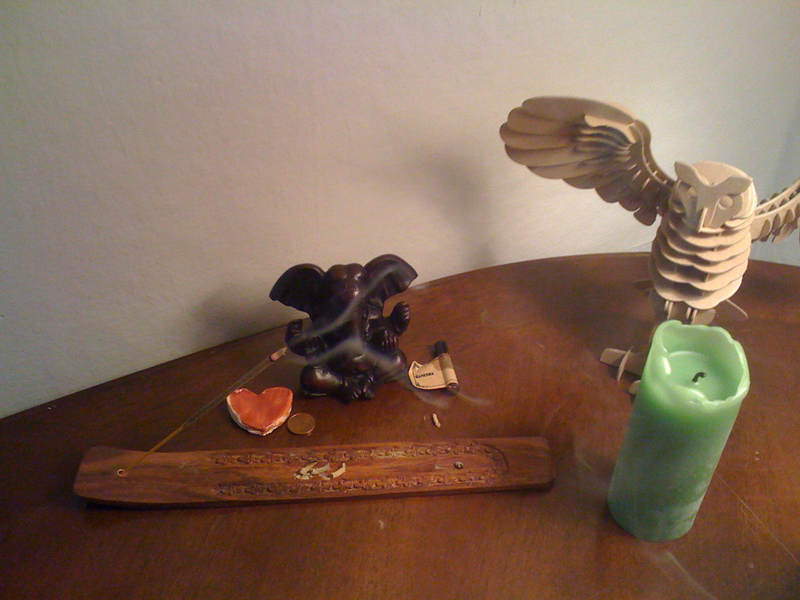 The green candle is one I burn while I write and I have the owl standing guard there too. Here we have Mary’s place on the top left of my altar case. Icons and pictures of icons. The triptych up on the wall is the Nativity, Mary with Child, and the Resurrection. Photos on the cabinet that you can’t see are of a statue of Mary at Shrine of St Therese in Juneau Alaska. I have a beautiful wooden rosary, given to me by a friend in Ireland years ago. A bottle of perfume for the Virgin (smells like lilies! ), and some rocks that I’ve mentioned before. The flower is fake – let us not speak of it. Finally, we have the body of my main altar case. This is what I see when I sit down. I burn candles in front of it, so I don’t burn the house down. The whole thing is very unfinished. I realize I got rid of so many items when we moved, that I have to start over. Oh darn, I have to hunt for new altar items. The top shelf has peacock feathers. The middle shelf has some ancestor and Might Dead items. 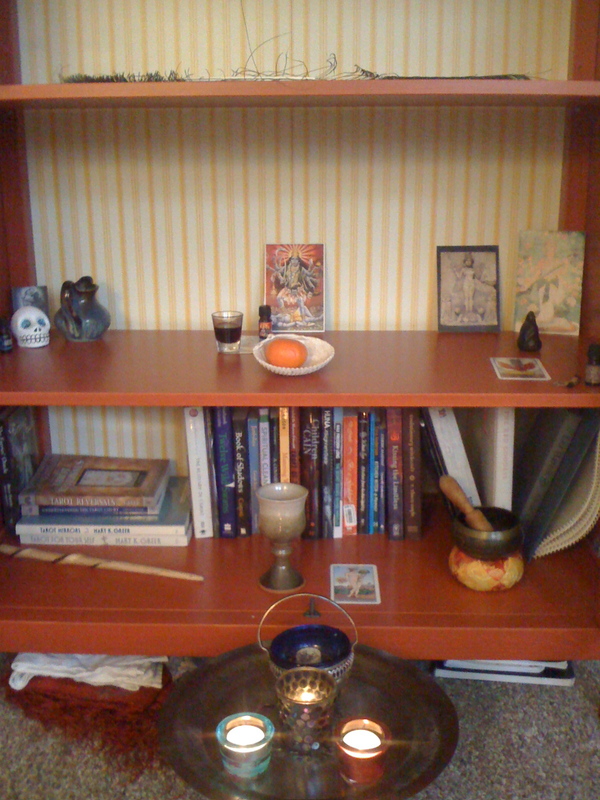 The middle has a picture of Kali, offerings of a fresh clementine and a shot of port. The right side has pictures of the Queen of the Night (ancient Iraqi relief) and Saraswati. Below are books, a wand I never use (I bought it in Scotland, it’s beautiful), my cup and a singing bowl. This entry was posted in Uncategorized and tagged family life, ganesha, Kali, sacred arts, the Gods, virgin mary. Bookmark the permalink. How did I do it? Sheer will! We spent 2.5 years in Wales never really moved in, living out of boxes, because we didn’t know how long we’d be there. This time I was determined not be living like that again. It also helps that I don’t have a job outside the home and a partner who works from home aaaaaaand that we are in a stable financial place to afford the furniture in the first place! That last one has often been a barrier, for sure. I definitely encourage you to get an altar in your creative space. I find a quick prayer and lighting the candle can really help me focus and get things done. Beautiful spaces to hold intention. Thanks for sharing them where I could see them. Our altars are constantly changing: for example, the altar above my computer held (stupidly) a particularly heavy piece that was inadvertantly knocked over one day when I wasn’t home. That showed me that less is sometimes more – especially when you just managed to save your keyboard. And every home should have an ikon of the Theotokos (god bearer)! One of the finer concepts the church (Eastern) ever came up with! I am a fan of the Eastern side of the Church. But it is no surprise as they wear their mysticism very close to the surface. 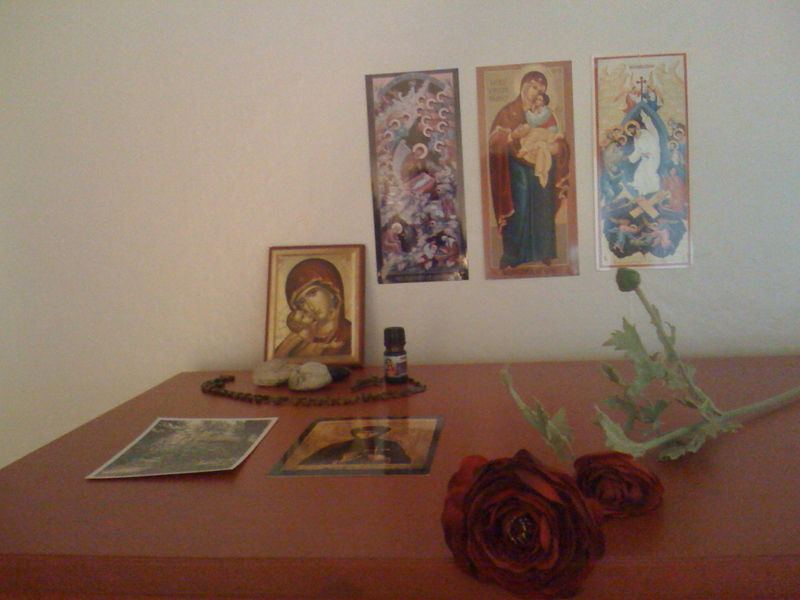 One day when I no longer have tiny children my altars will be larger and more out and about. For the time being keeping them compact and easily locked up is a priority. Perhaps sometime you will be able to see them in person!